In the wake of ride-sharing company Uber’s settlement of class action lawsuits in California and Massachusetts over the company’s classification of drivers as contractors, rather than employees, another class action has been brought in Chicago federal court demanding Uber’s drivers be treated as employees, with the associated rights and benefits, under federal labor laws. The action is one of two such class actions pending in the U.S. District Court for the Northern District of Illinois, and one of several filed in other federal district courts. 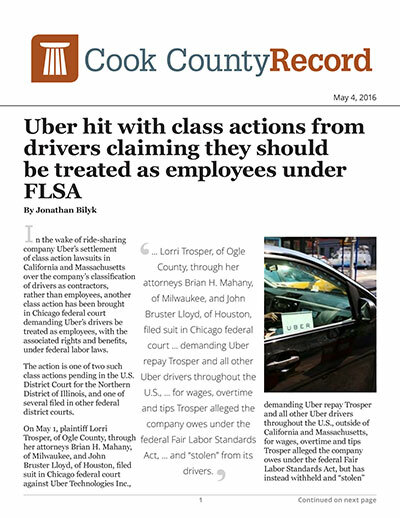 On May 1, plaintiff Lorri Trosper, of Ogle County, through her attorneys Brian H. Mahany, of Milwaukee, and John Bruster Lloyd, of Houston, filed suit in Chicago federal court against Uber Technologies Inc., demanding Uber repay Trosper and all other Uber drivers throughout the U.S., outside of California and Massachusetts, for wages, overtime and tips Trosper alleged the company owes under the federal Fair Labor Standards Act, but has instead withheld and “stolen” from its drivers. As in similar lawsuits against Uber, Trosper argued Uber has wrongly classified its drivers as independent contractors, using their own car to transport passengers and relying on Uber’s app to connect them with passengers. “Uber treats the drivers as employees, unless it costs it money, evidenced by its actions related to expenses and gratuities,” the complaint said. The lawsuit is the latest such filed against Uber in the Chicago district court. In December 2015, Uber drivers Horace Lee and Imran Sandozi, both identified as residents of Cook County, brought a similar class action against Uber, demanding unspecified back pay and punitive damages, among other damages, for allegedly misclassifying its drivers. Trosper’s lawsuit also comes weeks after Uber announced it had agreed to pay $100 million to about 385,000 drivers to settle similar claims against it brought by drivers in California and Massachusetts. The settlement would allow Uber to continue to classify its drivers as independent contractors, exempt from overtime, minimum wage and other labor and wage-and-hour rules. According to federal court records, four other such lawsuits have been filed in federal district courts in Oklahoma, Michigan, Florida and Ohio in the days surrounding Uber’s settlement announcement. According to published reports, more than 450,000 people drive for Uber.